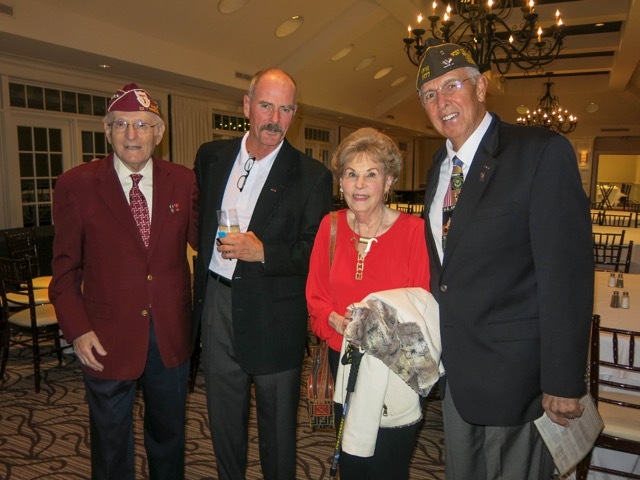 Our special guest and speaker on November 17, 2016 for our Veterans Day program: Eli Linden, WWII Army Veteran pictured with Air Guard Veteran Don Hollis, Eli’s wife, and club member Phil Rusciolelli. Eli shared his compelling story from serving in England across the North Atlantic as part of a 100+ freighter convoy, to Omaha Beach, to being captured in Germany. Liberated in May 1945 by the Russian Cossacks, he walked about five miles and crossed the Elbe River back to the American lines. He now spends a lot of his time sharing his war experiences with middle school students as part of the World War II history curriculum in Loudoun County, Virginia. He also happily greets other veterans who fly in to Dulles Airport on the Honor Flight Network to visit the World War II Memorial.